Yesterday I was on an author-meets-critics panel for The Triple Bind of Single-Parent Families: Resources, Employment, and Policies to Improve Well-Being, a new collection edited by Rense Nieuwenhuis and Laurie Moldonado. The book is excellent — and it’s available free under Creative Commons license. Most of the chapters are comparative, with data from multiple countries. I like looking at the figures, especially the ones like this, which give a quick general sense and let you see anomalies and outliers. I made a couple, too, which I share below, with code. 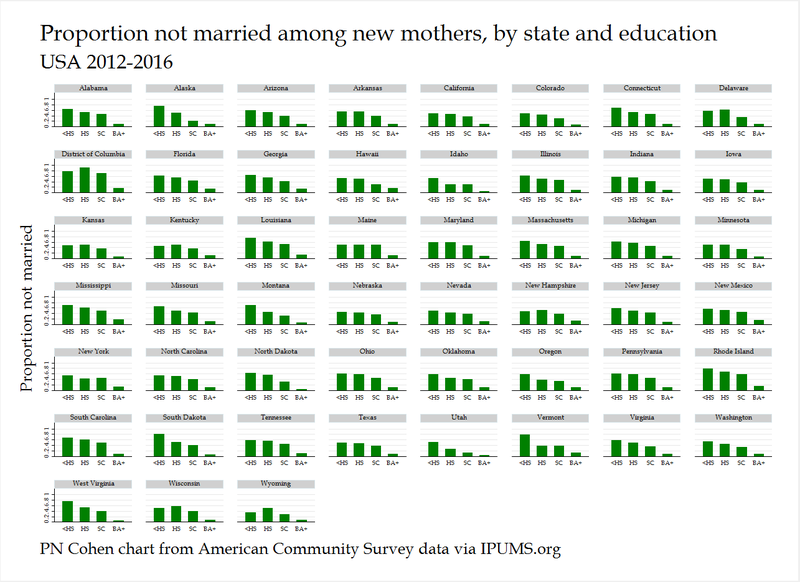 Here’s an example, showing the proportion of new births to mothers who aren’t married, by education, for U.S. states. For this I used the 2012-2016 combined American Community Survey file, which I got from IPUMS.org. I created an sample extract that included only women who reported having a child in the previous year, which gives me about 177,000 cases over the five years. The only other variables are state, education, and marital status. I put the raw data file on the Open Science Framework here. Code below. My first attempt was bar graphs for each state. 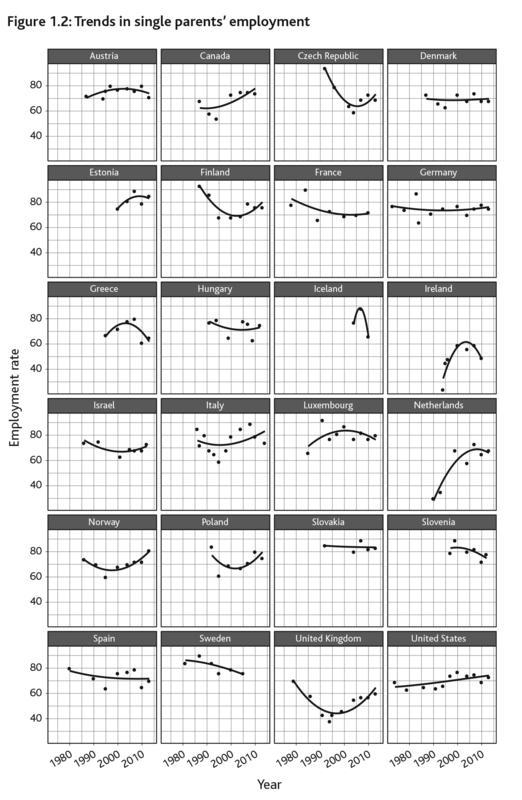 This is easiest because Stata lets you do graph means with the bar command (click to enlarge). The code for this is very simple. I made a dummy variable for single, so the mean of that is the proportion single. Edcat is a four-category education variable. The bar graph is easy, and good for scanning the data for weird cases or interesting stories. But maybe it isn’t ideal for presentation, because the bars run from one state to the next. Maybe little lines would be better. This takes another step, because it requires making the graph with twoway, which doesn’t want to calculate means on the fly. So I do a collapse to shrink the dataset down to just means of single by state and edcat. 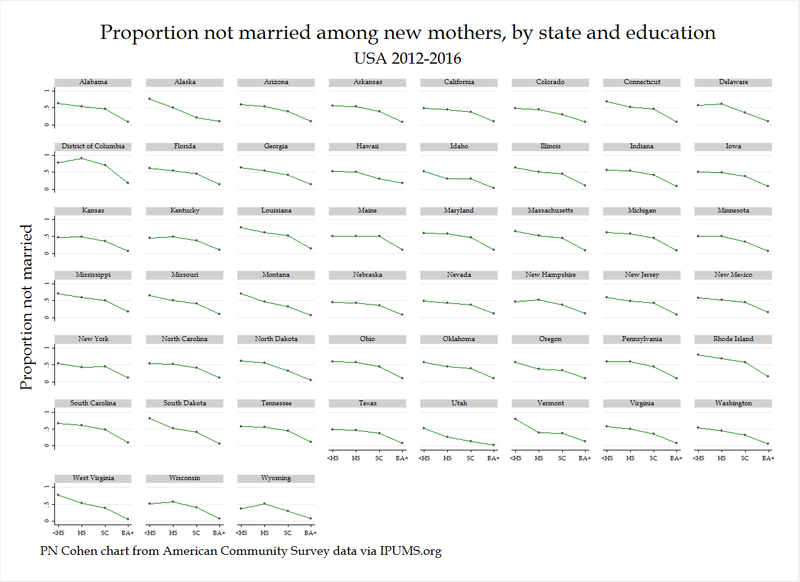 You can see the overall levels (e.g., high in DC, low in Utah) as well as the different slopes (flatter in New York, steeper in South Dakota), and it’s still clear that the single-mother incidence is lowest in every state for women with BA degrees. Sadly, I can’t figure out how to put one title and footnote on the graph, rather than a tiny title and footnote on every state graph, so I left titles out of the code and I then added them by hand in the graph editor. Boo. label var statefip "State (FIPS code)"
label var perwt "Person weight"
label var marst "Marital status"
label var educd "Educational attainment [detailed version]"
label define statefip_lbl 01 "Alabama"
label define educd_lbl 000 "N/A or no schooling"
label define edlbl 1 "<HS"
label define marst_lbl 1 "Married, spouse present"
“A small step forward, a big step for civilization” (向前一小步, 文明一大步). Every family striving to become a civilized family; everyone involved in its creation (家家争做文明家庭; 人人叁与创建活动). This is from the Shanghai public health authorities. (No, I don’t know Chinese, but I love trying to use a dictionary, and I ask people.) The fascinating thing about that is the composition of the civilized family pictured: father, mother, two grandparents, and two children. 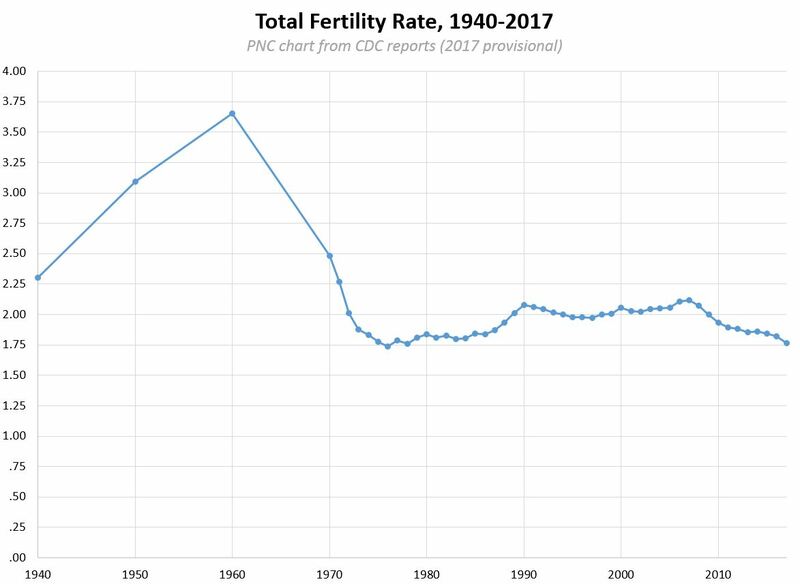 Fertility rates in China are well below replacement level, as they are in other East Asian countries, meaning the average woman will have fewer than two children in her lifetime and the population will eventually shrink (barring immigration). 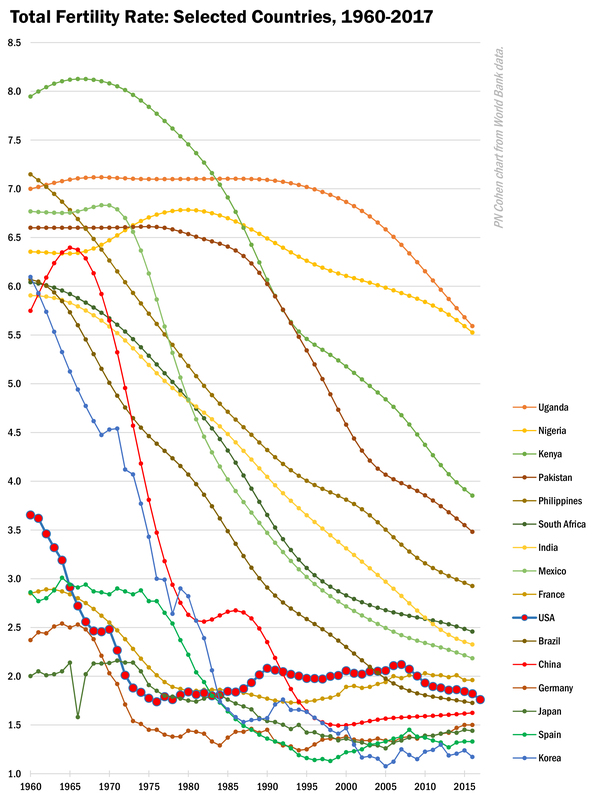 China’s total fertility rate nationally is probably at about 1.5. In Shanghai, a metro area with some 20 million people, the norm was already one child per family before the one-child policy was implemented in 1980, and fertility has continued to fall; it most recently clocked in at a shockingly low .88 per woman as of 2008. The website for this company promises, “Super IQ, Wealth of Creativity, Instant Memory Capacity.” How many kids are you going to send to this private program? This recalls another probable cause of low-low fertility, the gender-stuck family and employment practices that keep women responsible for children and other care work (scooter dads notwithstanding). In conjunction with women outperforming men in college graduation rates these days (as in the U.S.), this indirectly reduces fertility by leading to delayed marriage, and directly reduces fertility by causing parents to decide against a second child. The weak system of care hurts on both ends, with people having fewer children because raising them is expensive, and people needing children to take care of old people because public support is lacking. This may be one reason why grandparents can have a positive effect on parents’ motivation to have children, as reported by Yingchun Ji and colleagues (including Feinian Chen, who hosted my visit). The fact that it is common for grandparents to provide extensive care for their grandchildren, as Feinian Chen has described (paywall), presumably helps strengthen their pronatal case. This is a challenge for civilization. The pictures here, and a few hundred more, are on my Flickr site under creative commons license. * Americans who love the funny translations of signs in China may be in for some disappointment, as the Standardization Administration has announced plans to implement thousands of stock translations in the service sector nationwide. 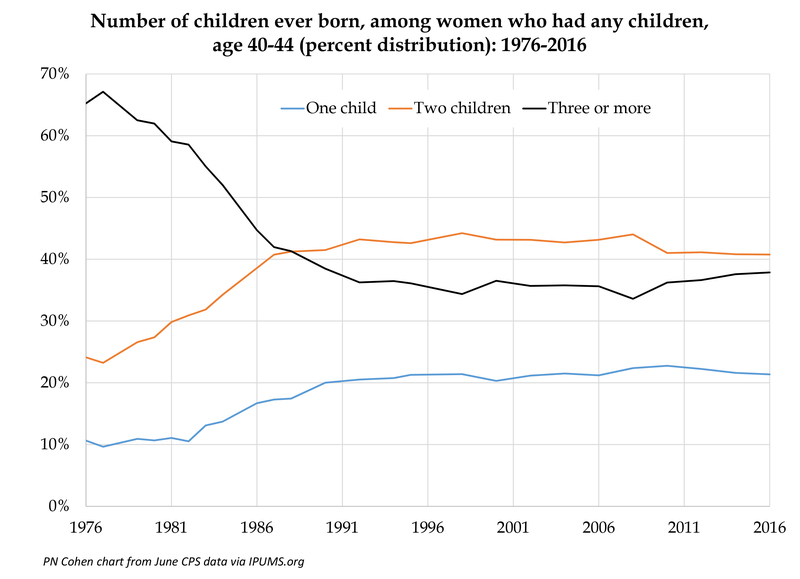 Never before have such a high proportion of all births been to women over 40 — they are now 2.8% of all births in the US. And yet a 40-year-old woman today is one-third less likely to have a baby than she was in 1947. From 1960 to 1980, birth rates to women over 40* fell, as the Baby Boom ended and people were having fewer children by stopping earlier. 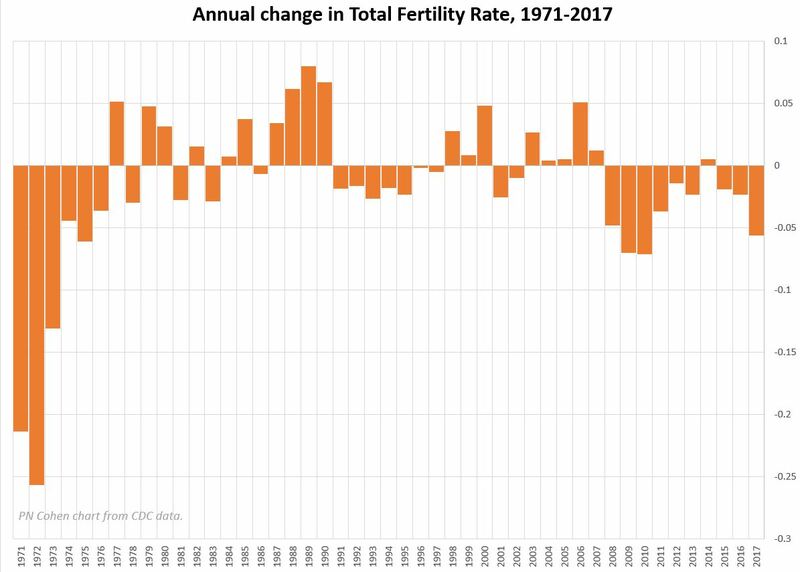 Since 1980 birth rates to women over 40 have almost tripled as people started “starting” their families at later ages, but they’re still lower than they were back when total fertility was much higher. Sources: Birth rates 1940-1969, 1970-2010, 2011, 2012-2013, 2014-2015; 2016; Percent of births 1960-1980, 1980-2008. 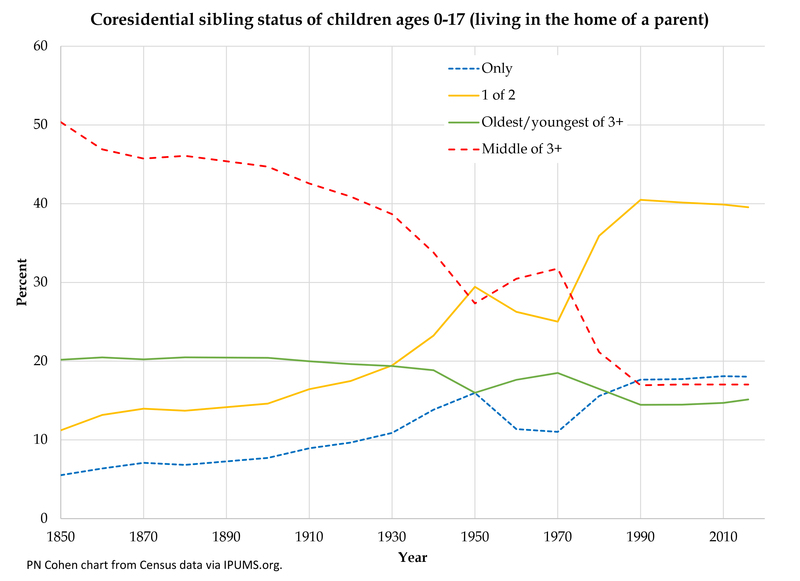 In the 1970s about 60 percent of children age 0 had three or more siblings present, and only 1 in 20 was an only child. Now more than a quarter are the only child present and another 30 percent only have one sibling present. (Note this doesn’t show however many siblings no longer live in the household, and I don’t know how that might have changed over the years). This updates an old post that focused on the health consequences of births to older parents. 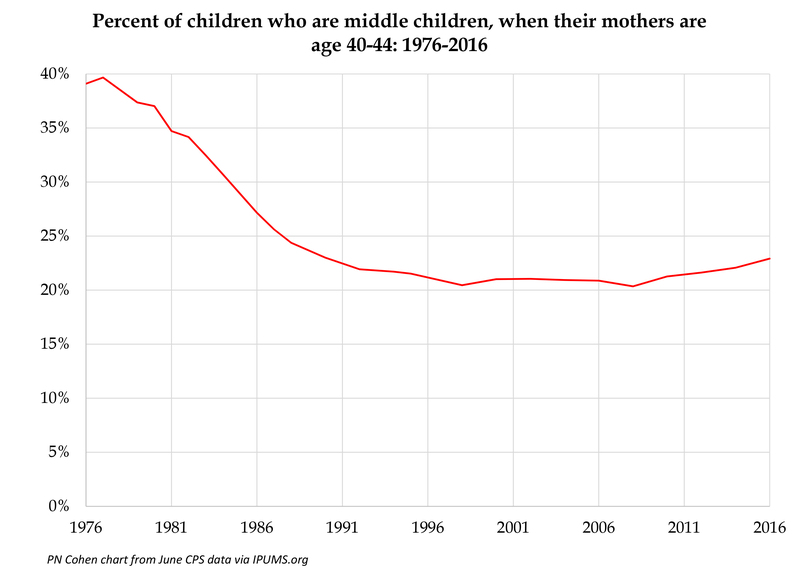 The point from that post remains: there are fewer children (per woman) being born to 40-plus mothers today than there were in the past, it just looks like there are more because they’re a larger share of all children. * Note in demography terms, “over 40” means older than “exact age” 40, so it includes people from the moment they turn 40. 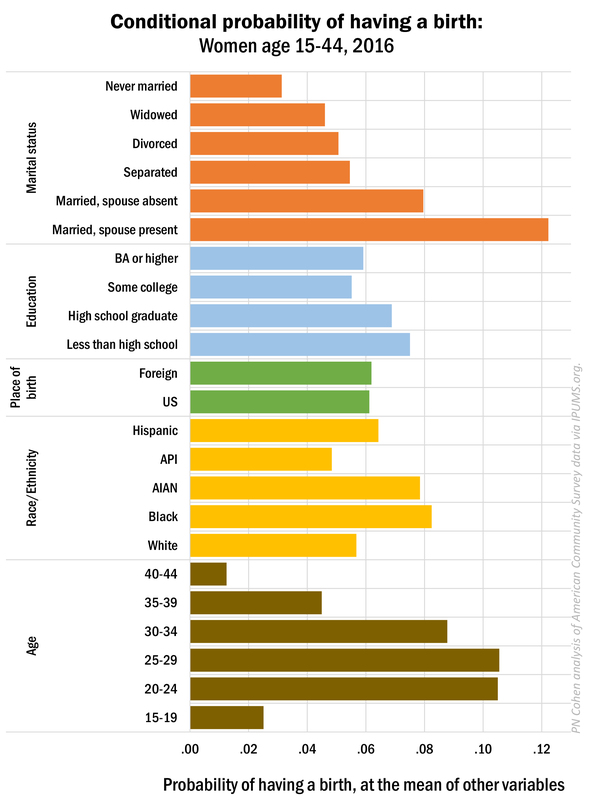 The other day I showed trends in employment and marriage rates, and made the argument that the generational term “Millennial” and others are not useful: they are imposed before analyzing data and then trends are shoe-horned into the categories. When you look closely you see that the delineation of “generations” is arbitrary and usually wrong. Here’s another example: fertility patterns. By the definition of “Millennial” used by Pew and others, the generation is supposed to have begun with those born after 1980. 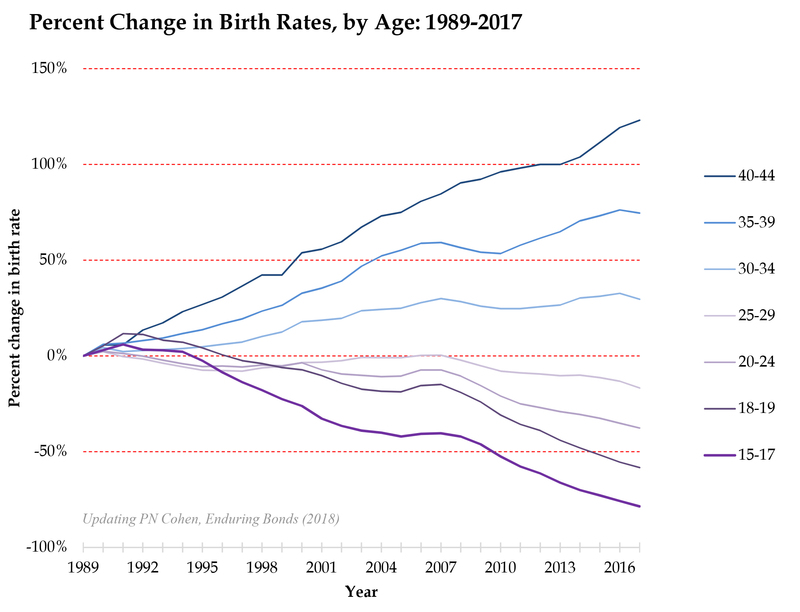 When you look at birth rates, however, you see a dramatic disruption within that group, possibly triggered by the timing of the 2009 recession in their formative years. I do this by using the American Community Survey, conducted annually from 2001 to 2015, which asks women if they have had a birth in the previous year. The samples are very large, with all the data points shown including at least 8,000 women and most including more than 60,000. 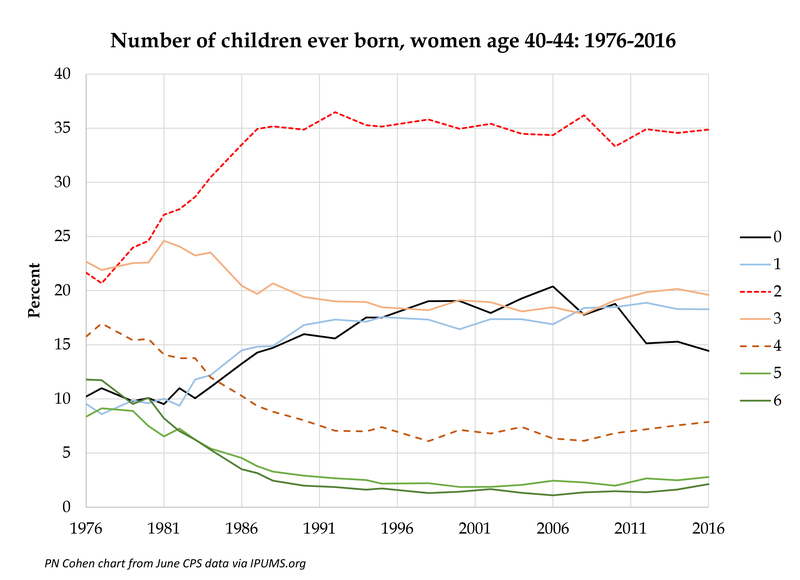 The figure below shows the birth rates by age for women across six five-year birth cohorts. The dots on each line mark the age at which the midpoint of each cohort reached 2009. The oldest three groups are supposed to be “Generation X.” The three youngest groups shown in yellow, blue, and green — those born 1980-84, 1985-89, and 1990-94 — are all Millennials according to the common myth. But look how their experience differs! Most of the fertility effect on the recession was felt at young ages, as women postponed births. The oldest Millennial group was in their late twenties when the recession hit, and it appears their fertility was not dramatically affected. The 1985-89 group clearly took a big hit before rebounding. And the youngest group started their childbearing years under the burden of the economic crisis, and if that curve at 25 holds they will not recover. 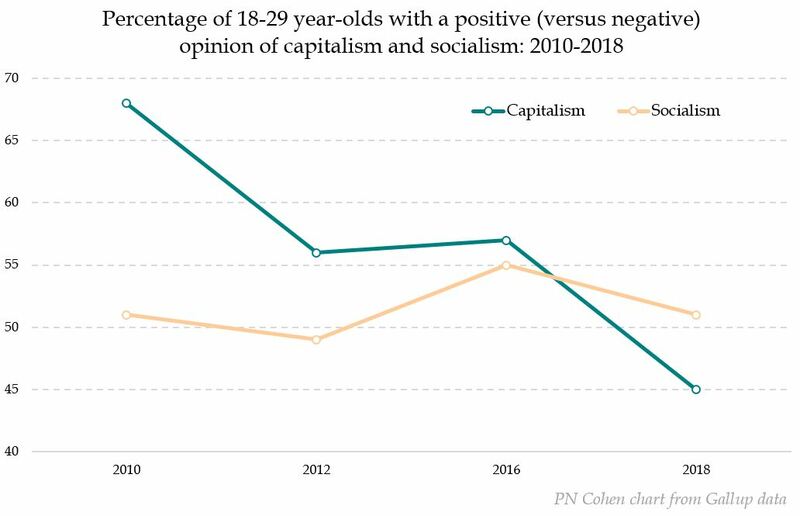 Within this arbitrarily-constructed “generation” is a great divergence of experience driven by the timing of the great recession within their early childbearing years. You could collapse these these six arbitrary birth cohorts into two arbitrary “generations,” and you would see some of the difference I describe. I did that for you in the next figure, which is made from the same data. And you could make up some story about the character and personality of Millennials versus previous generations to fit that data, but you would be losing a lot of information to do that. Of course, any categories reduce information — even single years of age — so that’s OK. The problem is when you treat the boundaries between categories as meaningful before you look at the data — in the absence of evidence that they are real with regard to the question at hand.